Excessive noise is ‘a global occupational health hazard with considerable social and physiological impacts’ (Nelson et al, 2005). According to the World Health Organization (WHO) ‘noise-induced hearing impairment is the most prevalent irreversible occupational hazard’ (Berglund, et al, 2000). Despite all of the progress to date, according to NIOSH (1998) ‘noise-induced hearing loss is one of the most prevalent occupational health hazards facing American workers today’, with approximately 30 million Americans exposed to daily noise levels that will likely lead to hearing loss. In some cases, hearing impairment is so severe it is classed as a ‘hearing handicap’ and it can impose major disadvantages in communication, with profound social and psychological consequences for the sufferer. Safety practitioners are often guided by the unmistakable adage: ‘prevention is better than cure’ and avoiding noise ‘at source’ is the obvious and preferred option. Statutory obligations effectively enshrine the maxim in EU law, however. Directive 89/391/EEC ‘on the introduction of measures to encourage improvements in the health and safety of workers’ (generally referred to as the Framework Directive) provides a well defined hierarchy for implementing preventative measures, with risk avoidance assuming top priority. This so called ‘hierarchy of control’ clearly applies to noise control although many employers assume that the provision of hearing protection is their primary duty. Notwithstanding the 1989 Directive’s provisions, there is widespread recognition that in many workplaces hearing protection devices (HPDs) will continue to be an essential component of the ‘practicable’ control mechanisms. Even with technological and manufacturing improvements and regular attention to noise control at source, HPDs will need to be utilised by many industries for the foreseeable future. This is in recognition of industry’s inability to readily source ‘quiet’ equipment and tools and also recognises the practical constraints which apply to retrofitting. 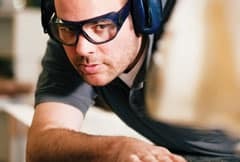 While hearing protection devices (HPDs) are generally regarded as a control of last resort, they can provide a potentially effective and reliable means to protect workers’ hearing. In practise, many employers assign hearing protection minimal attention and assume that by merely providing HPDs, they fulfil their moral and statutory obligations. For any HPD to be effective, however, regard must be given to a number of factors including: the potential attenuation of the HPD itself, the actual exposure conditions (intensity and frequency of noise), correctness of fit, duration of use, ease of use, and user acceptability. Despite this, individuals who are responsible for selecting and purchasing HPD generally base their decisions on two key criteria –unit cost and noise reduction rating (NRR). NRR is a US term and throughout Europe, Asia and Australia many different rating systems are used for HPDs. While efforts have been made to standardise the testing and rating of HPDs, the situation is still far from satisfactory. Potential users of HPDs will often enquire about the degree of noise reduction afforded by specific devices. The degree of attenuation provided by any HPD is strongly determined by the manner in which the HPD is fitted and worn (Casali and Lam, 1986). For many years there has been an awareness of a substantial variation in reported attenuation, and inter-laboratory comparisons (even under ‘optimum fit conditions’) have been disappointing. Throughout the EU, general requirements pertaining to the design and manufacture of Personal Protective Equipment (PPE) are set out in Directive 89/686/EEC (European Union Parliament and Council, 1989). This Directive specifies basic requirements for PPE, but more explicit obligations arise through specific European and international standards for HPDs. It is noteworthy that products marketed throughout Europe must be CE certified, and that the relevant European standards provide a focus for the CE certification process. In line with efforts to streamline international trade, however, it is likely that preference will be given to international standardisation as matters unfold. The benefit of any HPD should ideally be estimated, based on the stated octave-band sound attenuation data of the protector and the octave-band levels (SPLs) of the noise. In many situations, however, octave-band SPLs of the noise are not available to the user and for this reason simpler methods to determine performance have been devised (ISO, 1995). The ISO has provided three separate methods to estimate HPD performance in terms of the reduction in A-weighted SPL afforded when the protector is worn. The methods are outlined in ISO Standard 4869-2 (ISO, 1995) and are described as the ‘octave-band calculation method’; the ‘HML method’; and ‘the SNR method’. The latter two methods are regarded as ‘simplified procedures’ while the octave-band method is regarded as an ‘exact’ reference method. While primarily devised for steady noise exposures, the methods are applicable to noises containing impulsive components and have widespread application. All three methods require the HPDs to be tested in accordance with Part 1 of ISO 4869 (ISO, 1995) to generate ‘laboratory derived performance data’. This is normally published by the HPD manufacturers and under Directive 89/686/EEC, it must be indicated on the labelling or the packaging of the HPD. The HML method specifies three attenuation values, H, M and L (High, Medium and Low frequency), for a hearing protector. These values, when combined with the C and A-weighted SPLs of the noise, are used to calculate the ‘effective’ A-weighted SPL when the HPD is worn. The Single Number Rating (SNR) method specifies a single attenuation value or rating and this is subtracted from the C-weighted SPL of the noise to calculate the effective A-weighted SPL. The octave-band method requires the noise exposure to be characterised in terms of un-weighted (Z-weighted) Leq values over the frequency range, although the performance data are generally only available for octaves ranging from 63 to 8,000 Hz and often only for 125 – 8,000 Hz (particularly ear plugs). In reality, the assessment of HPD performance is merely a comparative analysis and ISO 4869-2:1995 states that the performance values for all three methods are only valid when “the hearing protectors are worn correctly and in the same manner as they were worn by subjects when carrying out the ISO 4869-1 test; the hearing protectors are properly maintained; and the anatomical characteristics of the subjects involved in the ISO 4869-1 test are a reasonable match for the population of actual wearers.” Thus, in practise the ‘real world attenuation’ provided by the HPDs will never really equal that achieved under laboratory test conditions. For this reason, it is currently recommended that a ‘real world factor’ of 4 dB is included in all of the above calculations (HSE, 2005); that is, the performance should be penalised by 4 dB. Real world concerns have been subject to much scrutiny in the US and the EPA (Environmental Protection Agency, 1979) has specified that HPD attenuation should be determined by the measurement of Real Ear Attenuation at Threshold (REAT). REAT measurements determine the differences between the minimum level of sound that a subject can hear without wearing a HPD and the level when the protector is worn. The difference between the thresholds provides a measurement of the device’s REAT. The notion of ‘de-rating’ HPD attenuation has been controversial, with manufacturers seemingly competing on a league table basis. While a 50 percent de-rating was suggested for all NRR data, some authorities have indicated that the percentage de-rating should be based on the ease of fitting. Thus, earmuffs might warrant less severe penalties than earplugs (Park and Casali, 1991). In the UK, 1998 guidance proposed that the protection value of ear muffs be reduced by 5 dB and by 18 dB for earplugs (HSE, 1998) to reflect ‘real world protection’. In the same year, the US authorities recommended that the NRR be de-rated “by subtracting from the NRR 25%, 50% and 70% for earmuffs, formable earplugs and all other earplugs, respectively” (NIOSH, 1998). While rating/de-rating is undoubtedly contentious, many authors observe that the key to effective HPDs’ use is in their selection, issuing and fitting. These observations are clearly borne out by the facts. Quite simply, in order for HPDs to function properly, they must be suitable to the user and, in particular, they must fit the user properly. Despite this, the majority of persons who dispense HPDs have no training and/or awareness of the fundamentals of HPD fitting and/or usage. Recognising that the human ear canal naturally varies in size and shape, many manufacturers of earplugs provide more than one size to ensure comfort and effective protection. In fact, some pre-moulded earplugs are available in up to five different sizes. Even earmuffs, which are relatively easy to wear by comparison, must be evaluated when initially issued. This is because not every user can be fitted by all models. In some situations the user’s head or ear size will fall outside the range that the head band or cup openings will accommodate. In some instances, there is the further difficulty of ensuring compatibility between the HPD and other personal protective equipment (PPE), e.g. fitting earmuffs on construction sites is potentially more complicated due to the use of hard hats and a requirement to attach and orient the earmuffs properly. Occasionally, safety glasses will also impede the proper fitting of ear muffs. Specifications for HPDs are generally based upon REAT measurements which were made under ideal laboratory conditions and purchasers can easily be swayed by the attenuation claims of manufacturers. Given that manufacturers’ claims are virtually always based upon optimum performance data, they do not provide any effective guidance in the selection and specification of hearing protection (Casali and Park, 1991). Researchers worldwide have identified the selection and fitting of HPDs to be the limiting factors and in a study of 48 industries throughout the UK, Leinster, et. al (1994) concluded that the ‘most common reason for failing to wear protection was discomfort’. To address some of the problems, guidance on the selection, use, care and maintenance of HPDs has been standardised in Europe with the publication of EN 458: 2004 (CEN, 2004). Caution should be exercised to avoid the selection of hearing protectors which provide unnecessarily high attenuation. Such devices can cause communication difficulties and they have the potential to be less comfortable than protectors with lower attenuation. These critical factors – along with regulatory inertia and risk perception – are major barriers to the adoption of pragmatic and effective hearing protection practises, and are most likely major contributors to the low level of HPD usage in certain industries. In the vast majority of cases, noise levels at workstations and noise from work activities in industrial and construction sites will involve ambient A-weighted sound pressure levels below 97 dBA. Because of this, the fit and comfort of hearing devices as well as their practicality of use under working conditions, contribute more to their potential effectiveness than does their published attenuation capability. While some exposure situations will require a highly rated HPD, many commonly used HPDs will potentially provide a degree of overprotection. This is a factor which partly explains the poor take-up of HPDs within certain industries and needs to be urgently addressed by employers, workers, representative bodies and enforcement agencies. Royster and Royster (1998) have defined an occupational hearing conservation programme (HCP) as “a systematic plan implemented to protect the hearing of employees from damage to hazardous sound exposures in the workplace.” An effective HCP involves a number of distinct yet interrelated phases and these are best described by means of a flow diagram. A risk-based approach should always be adopted with regard to the HCP and each of the individual elements must be clearly addressed within the statutory requirements. Unfortunately, nowhere in EU legislation are we told to knit the elements together into a cohesive and coherent plan. For the HCP to be effective in workplaces where the exposures remain hazardous, however, each element of the programme must be applied. The failure to fulfil obligations even within one element has the potential to threaten and undermine the programme’s success. Many employers still approach this important business on a piecemeal basis, however. Some consider the provision of hearing protectors as their sole obligation and many still regard the commissioning of a noise survey to be a supreme extravagance. The reality, however, is that each and every element of the HCP must be implemented to achieve control. Furthermore, the maintenance and demonstration of control is a fundamental prerequisite. There have been major technological advances over the past decades in the design and manufacture of HPDs. Hearing protectors have been designed and manufactured for special purposes and sometimes to encourage acceptability to the user, e.g. ear muffs connected by radio in order to provide communication and/or entertainment. Another feature involves fitting the ear muffs with acoustic frequency band-pass filters to enable speech communication between wearers, providing that the noise is out of the speech frequency band. Active noise control (ANC) ear muffs are now available which cancel the low frequency band noise inside the cups by out-of-phase generated sound. ANC systems operate by measuring a propagating sound wave and electronically producing a wave of equal magnitude and of opposite phase. The second wave will add to the first, cancelling it and eliminating the unwanted noise by destructive interference. Regardless of what form of HPD is available, however, there is a need for employee awareness, training and vigilance. In many organisations where reliance on HPDs continues, there can be systems failures purely on the basis of inadequate training. Best practise calls for training and awareness programmes to be rolled out on an annual basis. This is because improving employees’ understanding and awareness of hearing loss prevention increases motivation and participation in HCPs. Interestingly, there is a legal imperative – under the Physical Agents Noise Directive – to ensure that where required employees wear their hearing protectors. Finally, in establishing claims against occupational hearing loss many claimants will acknowledge that they were provided with adequate hearing protection but never understood what would happen if they did not wear it. The absence of a comprehensive training and awareness programme in such cases leaves the employer in a particularly vulnerable position.